The Fly Fishing Shop: Are you Ready?? Good July fish, sun a blazing! Yes I am talking about summer Steelhead season. Which at this point is about a month from good consistent fishing. 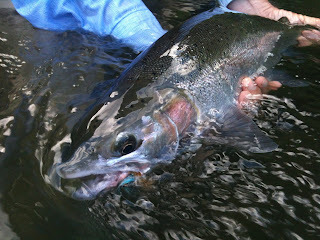 What ever Columbia river drainage you fish it is time to dust off your rods and reels and get ready to chase Steelhead. 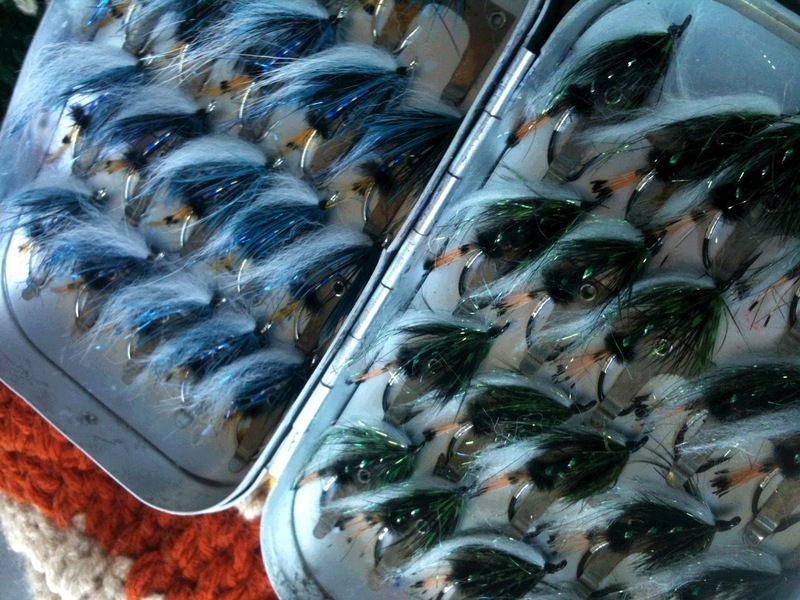 I am writing this because after I opened up my last years fly boxes and looked at the condition of some of me leaders and tippets, I figured I could not be the only guy with a short but important list of things to make sure I am ready to go that first time out on the water. Well stocked fly box is always a good way to start the year! Lets start at the terminal end of the tackle. A fresh box of flies could not hurt. Flies are what attach us to the fish. Rusty or bent hooks can be problems in the future. Weather you tie your flies or buy your flies, keep in mind up date you inventory. Having an wide range of colors and sizes is key in the summer months and is something I really recommend. Sizes from 3 to 10 are commonly used in my fishing. Like I have said before the warmer the water the smaller the fly I will use. Temps over 67 I go really small (that’s what the sparse 10’s are for). Color can be of personal preference but be sure small and dark is always an option in you Summer Steelhead fly boxes. Next I would check the where about of your thermometer. Having one is better than not having one. Keeping a close eye on the weather and the water temp give you a place to start. Not only with water type but size of fly. When I went to find mine it was broken so I am glad I checked before my first day on the river!! Now lets face it we have all tried to make use of every inch of leader we have purchased but the truth of the matter is buying all new stuff never leaves anything to question. So if you have any doubt while reading this go an toss all your old tippet and get new spools of…. Now listen very CLOSELY. MAXIMA!!!! There is no substitute for the best Steelhead leader material you can buy. If I told you only half the fish stories about big Steelhead I have seen landed on Maxima with wind knots in it, you would never use anything else either. Along with tippet goes your Polyleaders or tapered leaders. I would carry at least 2 Polyleaders. I have seen them last 2 years I have watched them be destroyed in 15 seconds. They cost 15 dollars but are worth every penny so take care of them. If you tie your own leaders then now is the time to start. So you are saving angling time not wasting fishing time or good drinking time building new leaders. Again use Maxima for your leader building kits. On a final note I would like to put Summer Steelhead fishing into perspective. Swinging flies for Summer Steelhead is not only a productive way to take fish but also defiantly the most enjoyable way with the highest amount of earnable gratitude. Now like with all angling for anadromous spices you are going to see all kinds of days on the water. Not catching fish is not only a possibility but also a fact of what will happen. In the end when I look back at my journals over a long enough time span, you will average one to two fish a day. I don’t like to view anything in fishing as a failure, especially things like Steelhead you can’t control. Always keep your eyes on the positive and learn something new everyday. And always have FUN!